Hiring the right talent requires tremendous efforts. What is the right talent? That depends entirely on the type of company you are looking at. If you are considering an engineering firm, the person should possess the required engineering skills combined with ability to use them. However, on the other hand, if you are looking at legal jobs, you should essentially look for a person with a sharp mind, who understands law and can roll with the punches, and also possesses the proper experience for the position. So, now that you know what kind of person you are looking for, here is how you can find them. You don't really need to put in as much effort as you think you do. Taking advantage of websites that allow you to feature legal job postings, all you just need to do is post a brief description of the job on that portal and allow the right candidates to apply. This is a fairly new way of posting a job that has become popular only in the last ten years or so. Before you begin posting a job, you need to understand why you should post a job on these kinds of portals. What difference will it make if you end up posting jobs on these portals? Law job postings on these portals allow you to reach a lot of people. The more audiences you attract, the more applicants you gain, and they are more convenient for job seekers. 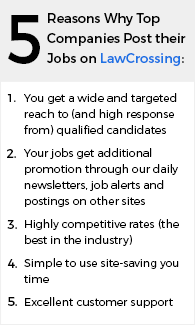 Also, these job posting sites are not only easy for job seekers to use, but as a recruiter they give you several benefits. These benefits include ease of use in posting, along with amazing customer support. By posting on these portals, recruiters can promote their job vacancies more easily. The major issue with legal jobs that most recruiters used to face was that their jobs were not being promoted in a major way. Therefore, most applicants, including those who fit the criteria of the post, were unavailable as applicants as they were unaware of the job vacancies. This resulted in the wrong people being appointed as the vacancies needed to be filled immediately. However, this scenario has changed thanks to law job posting portals. When you post legal jobs on such portals, your jobs are sometimes posted on 30 more associate sites, which are ranked among the top job sites. So, basically your job posting is sent to more than 30 sites. This maximizes your reach and helps you find the right candidate. This portal acts as a mediator between the recruiters and the potential employees by monitoring the recruiter's needs and the employees' skills. Posting a job on these portals is as easy as clicking your mouse. You just enter the details of your listing or listings on the job boards and hand over the rest of the work to the legal job posting portals. In addition, you can even search for resumes on these portals. You can also add users who can access your account, which is helpful if you are working with other recruiters to find a candidate. Hiring for recruiters is made much easier with the use of legal job posting portals.